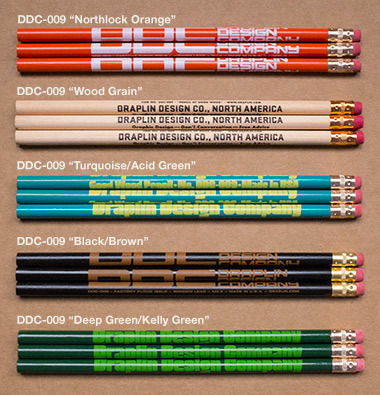 Draplin Design Co.: DDC-009 "The Good Wood Pencil Set"
The second pencil in our fleet. This time, we went round and applied our proud graphics with hopes of years of writing, drawing and freehanding prowess. The results have been “less than average” and artistic attempts worth saving “scant at best.” But don’t let that sway you. Our time-tested policy of being “open, honest and downright ugly” with our business literature should just reinforce the fact that this is something you could use, in many situations both personal and professional. This barely makes sense. We know. Comes in a multitude of colors. 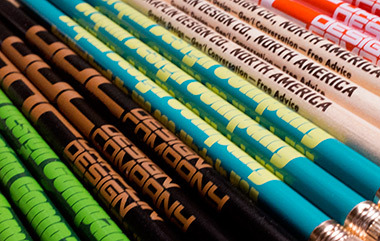 Northlock Orange, Natural Grain, Turquoise/Acid Green, Black/Brown and Deep Green/Kelly Green. Three pencils in a set. Good value. Buy now. 01. “Gary Nose” Black ink, on heavily-laquered natural woodgrain. 02. Often used for writing. 03. “Comfort Feel” round profile. 04. Over 50 miles of writing in each set. 10. Shiny ferrule, when melted down, can be used for basically nothing.